It’s never a good sign when the local men are screaming. I had pulled over to let them pass me on their caravan of motorbikes and this is their reaction to something only ten feet ahead of me. It’s nighttime. I’m alone in the mountains of Bali surrounded by jungle. What could possibly illicit these grown men to scream? And then I see it. Before this moment, I had been pretty convinced that the man skidding off his motorbike right in front of me would’ve been my top news for the day. But now I’m not so sure. My little apartment is located down what, in most places, would be a footpath. Typical of Ubud though, this path has both walkers and motorbikes navigating down its winding curves. On the last stretch before reaching the gates of Rumah Pakir, the place I’m calling home for the week, the road narrows to something about as wide as two fists. When I started driving here, I’d only navigate this treacherous part with my feet down to catch myself from falling into the rice paddies, located on either side of the raised path. Now I am a much more confident motorbike driver, or… I was before witnessing the local guy fall right in front of me just seven minutes ago. Any imprecise move on this ramp will take me down a four foot drop into the muddy, rainy fields. As I near this section of road, I see the group of bikes in my rearview mirror and pull aside for them to take the narrow part first. What I’ve learned is that most Balinese people learn to drive at age ten or so – it isn’t abnormal to see kids driving who can’t reach their feet to the ground. My one week of training couldn’t possibly take my driving to their level, so I feel no shame in letting these men pass and acknowledging that I’d only slow them down. As they swing by me, I hear them all scream and see them accelerate down the road. The hair on my arms stands on end. It’s definitely a snake, I decide. I’d been mentally preparing for this moment for months – my snake-guard has never been down. In Bali especially, they are prominent. It’s a whole cycle: rats go in the rice paddies, so snakes are known for living in them as well, getting a tasty meal every now and then. 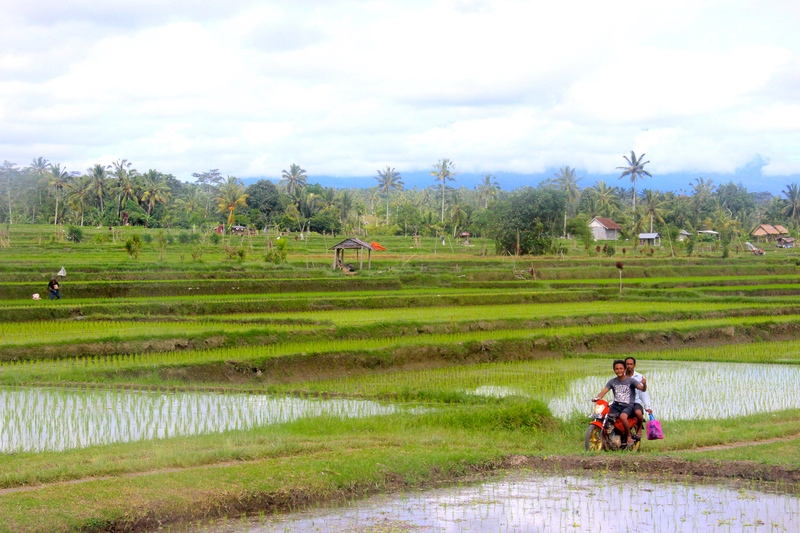 I love rice paddies – I drive for hours to find the best ones, but I would never step foot in a paddy for this reason. When the motorbikes clear out, I see no wriggling snake. I see nothing at first. It’s only as I slowly approach the thin ramp that I finally see it. Standing directly between me and my homestay is a huge scorpion. He is comparable to the size of a crab – five times as big as I thought any scorpion could be. And here we are, together alone in the dark, playing an unsaid game of chicken. My motorbike was blessed with an offering left on it each day. My mind immediately goes to the movie Hook, in which the captain’s debut scene shows him locking a thief in a trunk and dropping a (comparatively) teeny scorpion into it. The man’s blood-curdling screams go on for, what feels like, a very long time before it’s silent. That has always been my association with scorpions, but I guess I’ve never actually seen one in person to realize this. Needless to say, I have no plans to stand up to this guy. It’s quite a scene. The scorpion stands directly in my headlight. We stare each other down (or up in his case). His giant claws rest on the ground and his tail remains curled into the air. He is still as a statue. His shadow projects onto the beautiful, dark rice paddy in front of me – huge, menacing, the stuff of a child’s worst night terrors. I suddenly notice the fact that I am wearing flipflops. Even if I were a good enough driver to blow past this guy, he might grab onto my exposed foot and get me anyways. The only thing I can do is wait. And for about twenty seconds, I do, even though the creature only about four feet in front of me, because I don’t want to anger him by moving. Suddenly, he picks up his claws, curls his tail higher, and approaches me. He moves swiftly considering the size of his legs. I struggle to gain control of the heavy motorbike and use all my strength to put more distance between us. After increasing the space to about ten feet apart, to my surprise, the scorpion moves right off my path and into the shadows. This is my chance to escape. I give a quick rev to the bike and swiftly pass over the remaining hundred feet of road before parking in Pakir’s little lot. I throw down my kickstand and dismount the bike, pulling my helmet off as I begin the run to safety – the porch of my little apartment is only 30 feet further. As I start to open the property’s gate, something goes flying through my peripheral vision. I scream, not able to contain my built-up fear anymore. I look down to where I had seen the movement and, with relief, I find that it is just the toad that sits in the door each night. I am able to breathe for the first time in minutes. 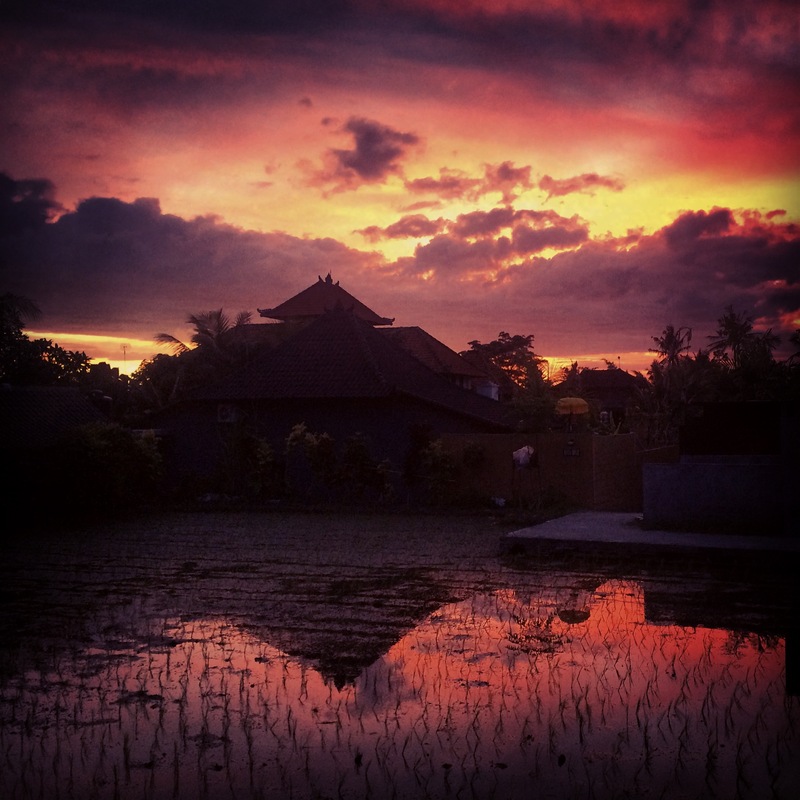 Jesus, Bali – you are not for the faint of heart. I sort of had a little anxiety for you! I do NOT like snakes either but I wasn’t prepared for a scorpion while reading. I would have screamed like the guys. Ha!